My sister is so cute and now, SHE HAS A BLOG! She's the marvelous mom to Erin Jane, Patrick, and Megan. She and her family annually invite us to their favorite local pumpkin patch. She also is the maker of the gingerbread houses that we decorate each year. There is far more to my eldest sister and her spoiling of us and many others. Why not stop on over and encourage her by leaving her a comment? Cause ya know, ALL bloggers LOVE comments (hint, hint). I mean, it's not WHY we blog or anything. But the thrill of seeing we have a comment is exhilarating! Any who, this post isn't about me. It's about Karen! Check her out at The McDermott Zoo! Since it's just about done, I want to share some images of the destruction transformation of our back yard. I took the first three photos back in December when I noticed the tree cutters a few houses down. Shortly after the new year, we were asked for our "consent" to remove any and all trees on our property that were taller than and within ten feet of the power lines. I put that word in quotes because we either had to consent or know that we would be responsible for the cost of any damage that our trees caused to the power lines in the future. A few people around us are taking that risk. But it seems that most folks are "consenting." We only actually had two trees on our property near the lines and only one had to be removed. This row of hemlocks belonged to our backyard neighbor. They had planted the trees many years ago. They made the "forest" in our backyard. They provided a lot of shade and a pleasant illusion of being in a more rural area. Sort of. In the photo below use the fence and umbrella as a frame of reference. All of the wood piles will be removed in a few weeks, we're told. Our freighbors have been affected as well. This is a shot in the direction of their yard. We're trying to remain positive and flexible. Honestly, I get a sinking feeling in my gut when I look at these pictures. There has been some talk with our back yard neighbors about what they're planning on doing to replace the missing trees. I'll be sure to update once the transformation is complete. With more sunlight, we're BOUND to have a better veggie garden than two summers ago, right? I decided to look and see what pictures I took one year ago today. It looks like I was getting my floors cleaned this time last year. Those Target squirt bottles have been good for hours and hours of watery fun. Ya gotta love that smiling face of a little girl that is pleased as punch with herself. This going-under-the-water thing is new for Miss Vi. I'm thinking it just may progress further, once we can get some pool time in. ...to wave to daddy as he leaves! Amelie started this tradition and I think I'll be sad if it ever ends. There are times, albeit they're rare, if it doesn't happen just right, that Daddy is summoned back, via cell phone. And he comes. Gets out of his car. And knocks again. Gets back into his car and waves until he's out of sight. During high school, I was blessed to travel to Europe twice for spring break. 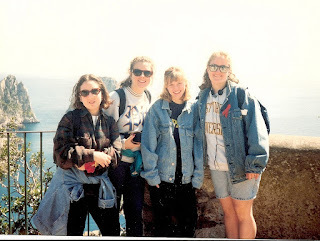 In 1992, my friend, Diana, and I, along with a group from our high school, traveled to France and Spain. We created treasured memories on that trip. There are things that we still laugh at when reminiscing about that adventure. 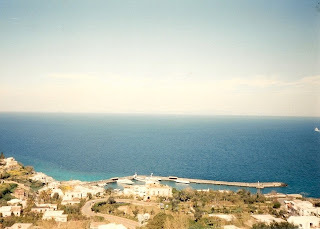 In 1994, our senior year, we traveled to Italy and Greece. This time two other friends joined Diana and me for this amazing trip. We had so much fun! 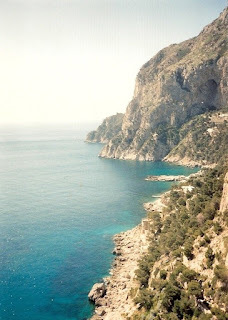 Unanimously, I think, our favorite stop was the Island of Capri. It was so amazingly beautiful! My friends Jill, Diana, Grace, and me with the beautiful water scape behind us. The most exciting part of the excursion was finding my prom dress in a shop on the island. Grace and I went in and found dresses after much deliberation and consideration. We felt so sophisticated! 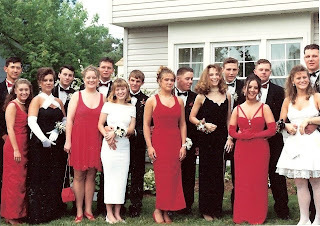 To have Versace prom dresses that we'd bought in Europe! Certainly, you can't get anymore exciting that that! O.K. So, I'd never even heard of Versace and didn't notice the name in the tag until years later. But still--prom dresses from Italy! 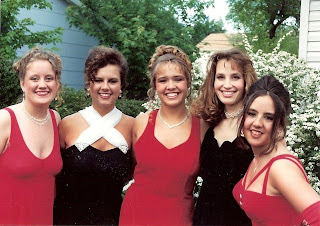 I'm slightly embarrassed by the lack of fabric, but I was 18 and thought myself to be quite glamorous. We didn't plan the black, white, red theme, but it certainly made for great pictures! Oh, and where is that dress these days? In the dress up box, of course! A while back, Amelie discovered the dress in my closet. It was still there, since I couldn't bear to part with something that was attached to such great memories. (The story of my cluttered life, actually.) She asked if she could wear it. I hesitated briefly and then thought better of it. Why NOT? Her daddy had already made it clear that NO lady was leaving the house in it. Ever. So, why not add it to the dress up box? She's had so much fun in it. It makes her feel like a grown-up and it's being put to far better use than just hanging in my closet. And since her daddy will forbid her from wearing it when it actually fits her, why not now?